Glenn Mitchell is a native of Los Angeles, CA. She has been in the salon industry for 15 years and is a licensed color specialist. She has trained at the AVEDA Institute in Minneapolis and New York. 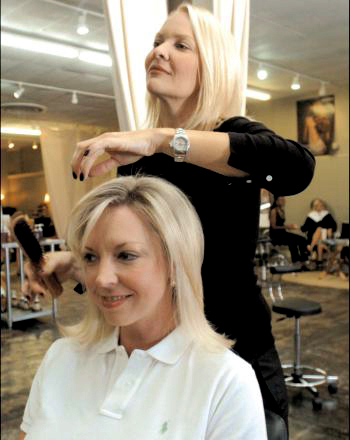 As a teen, Glenn moved to Decatur, AL where she discovered a natural talent for hair styling. In 2001, Glenn opened Red Jasper Spa and just recently revamped the space and gave it its new name... shine(salon)! At 5,000 sq feet it is the largest AVEDA concept salon in North Alabama. Glenn’s work has been showcased in multiple trade and consumer magazines, and she has even worked as a hairstylist at New York Fashion Week. For the last three years, Glenn has volunteered her time and talents to North Alabama’s “Mission: Makeover” program, giving well-deserving people within the community a new look. Glenn has been featured in magazines such as Allure, Bliss, Salon Today, Marie Claire, and Glamour. You can also see Glenn as a cast member in the second season of the hit Bravo TV reality show "Shear Genius." Click on the thumbnails below to view images of Glenn full size.